Last Tuesday, I woke up intending on a quiet day: play some trains, sit around on the floor, read books. That, as it turned out, was not in the cards. The hostages must have slept poorly, because they emerged from their rooms in full 4-and-1-year-old form. Luckily for me, while they might have the agency to fling their breakfasts on the floor and pull each other’s hair, as of yet they can’t unbuckle their own seatbelts, which means I still have some power. And, truth be told, I am not very good at keeping the peace between two strong-willed and rascally small people at home...but I am very good at driving my car long distances. So we drove, music blasting. And drove. And bought lunch. And drove. 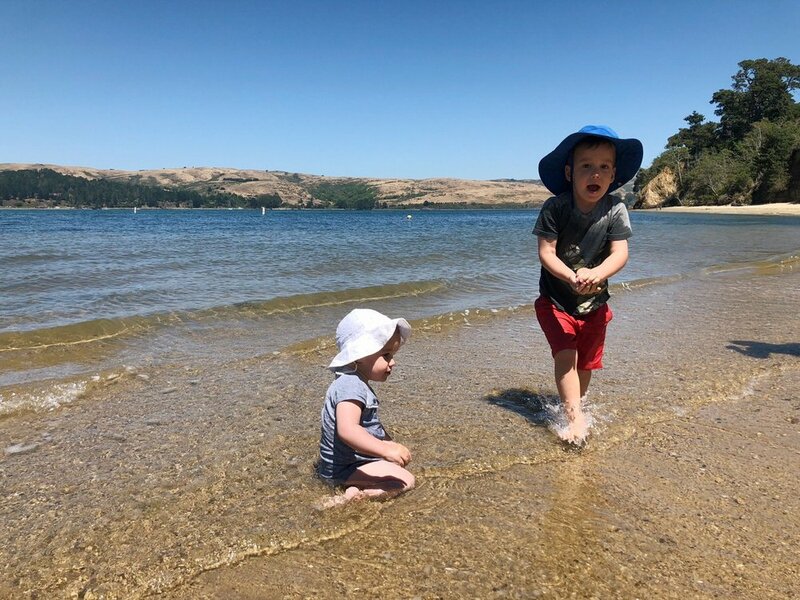 Next thing I knew we were 2.5 hours from home, exploring shipwrecks and swimming with our clothes on in Tomales Bay, at what might possibly be the only ideal swimming spot in the whole Bay Area (warm, shallow, clear, calm). And no towel—ain’t nobody got time to pack the car when there’s a mutiny afoot. We air-dried, marginally, and I drove our hot wet sandy selves 2.5 hours home. Dinner and bed, and boy did they sleep. Sometimes I actually plan fun things in advance (okay, almost never: I'm a high-functioning INFP), and some days I think, "Everyone's in a good mood! Let's go explore!" and we go off happily, like purposeful elves. But the truth is that in this frenetic stage of life, most of our adventures start out as desperadventures. It goes something like this: rough morning, grumpy people, get in the car, where are we going? I don't even know! Desperate times call for desperate road trips, and swimming holes, and ice cream. (Side note: It's one of the often-overlooked facts of life that going out for ice cream is a key to beating survival mode, if only for 20 minutes.) Here's the great thing: even if the adventure started with a bad mood and a touch of distress, it still counts as an adventure. And it gives us a shot at turning the tide of a day. Our general mood tends to improve with a little change of scenery—not always, but often. On those Lord-help-me mornings, I've just got to hunt down a little bit of wonder. Sometimes that means walking over to see the house with the roses, or ice cream before dinner, or driving 100 miles to a swimming hole—provided I remember that there's no rule against any of those things. Wonder is wonder, whether or not you were grumpy when you headed toward it. Mercifully, in most cases, the spilled water, the bad attitudes, the thrown breakfasts, the pile of trashed clothes all fade from memory, and these things linger: the picnic by the shipwreck, the swimming in your clothes, the wildflowers, the jubilant sand-covered baby, and the collection of mussel shells. I never have the stupid towel when I need it. But that’s not what I remember a year later.